Geared Motor With Em Clutch Brake Backed by the sound infrastructural facility and experienced personnel, our company has been able to emerge as one of the renowned manufacturers and exporters of Geared Motor With Em Clutch Brake. 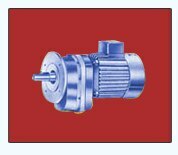 Our skilled personnel help us to render these geared motors with brake and clutch arrangement as per the need of clients. Our manufactured Geared Motor With Em Clutch Brake is used to operate the clutch system. This geared motor is high in demand due to its compact design, robust construction and long operational life.